As the services guy, I never get to blog about hardware, but now I have my chance! 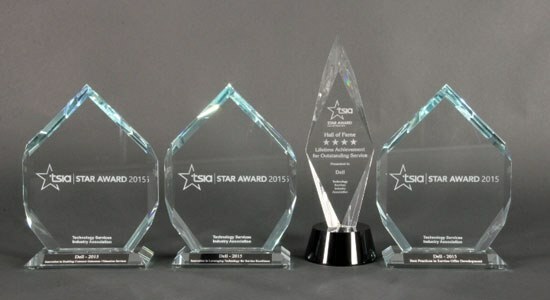 Today I’m writing about a different kind of “hardware” though, the TSIA STAR Awards. The Technology Service Industry Association (TSIA) is the industry association if you work in high tech services. The prestigious STAR Awards have been handed out annually over the last 25 years for top achievements in our industry. At first, even my son thought this was a big deal, because he thought we won a Star Wars award. Dell was honored with 3 of the 12 overall awards and recognized with a Hall of Fame Award as this year’s trio put us into the elite category of companies with 5 or more STAR Awards. That’s like having your movie win an Oscar in multiple categories and being recognized with a Lifetime Achievement Award all in the same year! Hardware aside, what I’m most thrilled about is that our vision of providing software-enabled proactive services is not only here, but being recognized by our industry peers. ProSupport Plus won in the category of Best Practices in Service Offer Development. We created a smart, complete service that also happens to be the first and only one on the planet to include proactive and predictive support for PCs and tablets. Our customers have shown us they embrace ProSupport Plus as well by making it the fastest growing service in the history of Dell. The secret sauce behind ProSupport Plus, our monitoring technology, SupportAssist, took home hardware for Innovation in Leveraging Technology for Service Excellence. Inspired by our capabilities for servers, storage and networking, our services software engineers extended the concept of monitoring to PCs and tablets. SupportAssist helps our customers reduce time on the phone with tech support by up to 84 percent, freeing them to innovate. While we’re honored by so much recognition, we’re just getting started. Over 35,000 Dell and partner professionals in over 150 countries are working hard to prevent the need for service tomorrow. These awards are proof positive that their commitment is paying off and that we are delivering a proactive service promise today. We may not have won Star Wars awards, much to my son’s chagrin, but the force is undoubtedly strong with our Dell and partner professionals as they continue to deliver the best in services innovation to customers around the globe…and maybe one day across the galaxy. If you ever want to talk services or share your experiences with our ProSupport Plus, SupportAssist or our Education Services, I’m on Twitter @jimroth.